Whoa. What was that Rookie Shootout?! Sandfer and Smith didn't perform as the starting position said. Yet again, Las Vegas is now a shuffler, and the draft is more noticeable. According to the results, Sandfer and Smith are equal contenders for Rookie of the Season. As for the other rookies, Weeks and Brock could be studs. Note that Dajon Weeks is running 12 races; we go by average finishes. They perform well. However, every race in Slim Jim Series (well almost) has something that is screwed up. First off, Carter and Cooper. It was a racing deal, but what even is that wreck? I don't think it's too serious from what I saw, but crap. Also, Marco Rossi. Really?! He's not even an oval driver but perform like it was the 1 in 70. And Rossi didn't commit murder yet. I'm not mad at him. Just surprised. Qualifying for the Tabasco Shootout will be up tomorrow. RJ Manson took another one at Las Vegas. This is his third pole in his last four Vegas races including his Rookie Shootout pole last season. Manson seems to be a very good qualifier at Las Vegas. 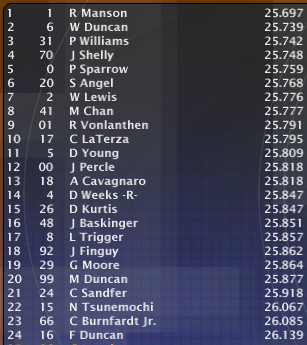 The Duncan brothers are 2nd with William Duncan and 20th with Matt Duncan. That is very weird for Matt to struggle. Our Season 4 favorite Sean Angel starts in 6th. Our Las Vegas winner from last season Charles Sandfer starts in 21st. Our last notable is Dajon Weeks, Season 4 Rookie Shootout winner, starts in 14th. The Tabasco Shootout will go up tomorrow. The Tabasco Shootout is up! Next up after this is the first round of the Slim Jim Series at Las Vegas.